Hi everyone! I’m Jen from the Sewing Rabbit Team, and co-author of the blog Eat. Sleep. Make. with my sister-in-law, Shannon. Shannon and I love to share tutorials and DIY’s that range from sewing, parties, home decoration, recipes, and everything in between. A major part of that “in between” for me includes sewing for my children because, as I’m sure many of you can attest to, they grow entirely too fast. And that means they need new clothes entirely too often. I’m so glad Meg hosts KCW every year because I need that little extra kick in the pants to sit down and add to my kids’ wardrobe! Peplum tops. I can’t get enough of them! I love that they’re trending right now because it was the perfect excuse for me to make one for my girl in autumn colors. To tell you the truth, I made 4 of these tops for my daughter because I couldn’t stop myself after making one. 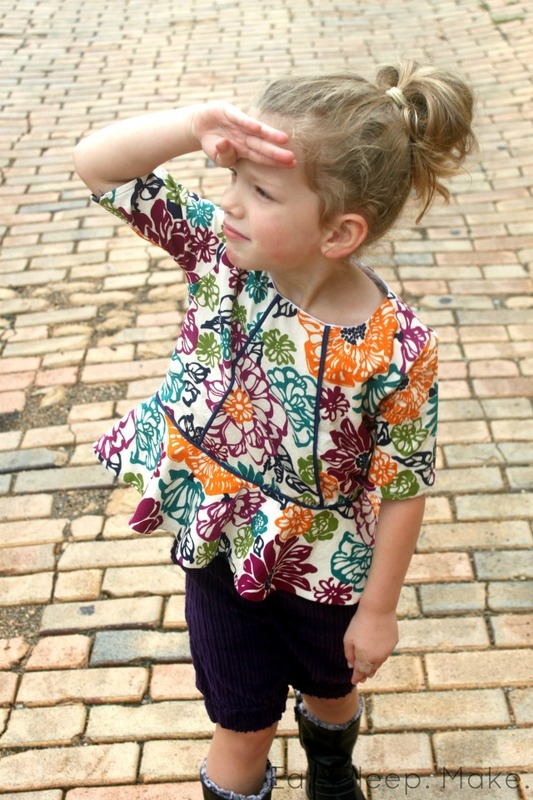 Peplum tops are flattering on both adults and children, but my daughter is especially fond of this particular shirt because the peplum does a little twirl when she spins. And what little girl doesn’t love to twirl? To make this top a little more appropriate for colder weather, it is fully lined and the sleeves are 3/4 length (though they could easily be lengthened if you prefer long sleeves.) 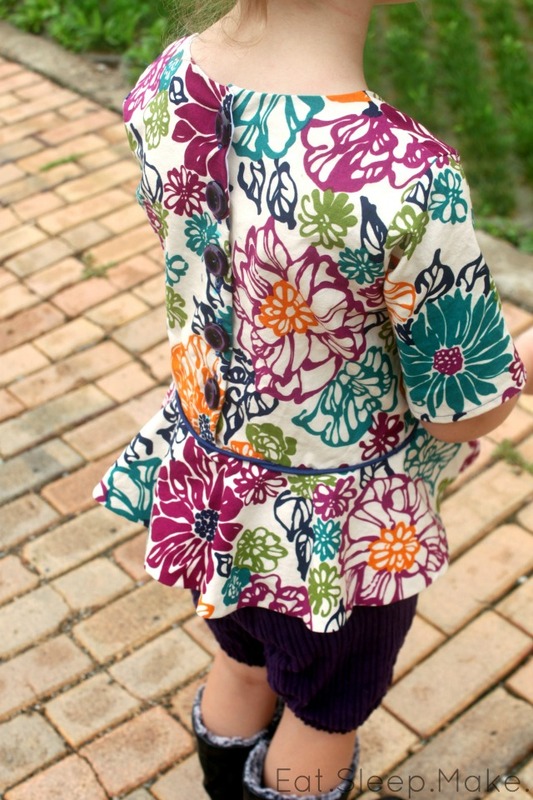 The thing that makes this shirt special, though, is that it includes piping on both the bodice and peplum. If you’ve never worked with piping before, don’t worry! It’s super easy and adds a lot of visual interest to the top. Note: if you’ve never cut out a peplum before (which is basically a circle skirt), it may look a little strange. You’ll need to fold your fabric in fourths and then lay your pattern so that the flat sides of your pattern are on the folds as shown above. If you’re still confused, Dana has a great tutorial on how to make a circle skirt HERE. ONE: after you’ve cut out your main bodice piece, fold it with wrong sides together (WST) and use your ruler and disappearing ink marker to draw a line from the neck to the bottom along the dotted lines indicated on the pattern. Use your rotary cutter to cut along the line you just drew. TWO: your main bodice piece should now be cut in 3 pieces, which I’ve labeled A, B, and C for clarification. The pink floral fabric I changed to in these next few steps is still the main fabric. I just made a couple different versions to perfect the assembly, so don’t be confused! ONE: to attach your back bodice to your front bodice, place your right and left back bodice pieces on top of your front bodice with RST. You’ll notice the back bodice pieces overlap an inch or so, that’s what you want! Pin along the shoulders only and stitch with your regular sewing foot to attach. FIVE: now fold your top together so that it’s inside out. Pin along the bottom of each sleeve and down the side. Sew. Repeat for the other side. Finally, add buttons! You can’t go wrong with purple buttons. Careful. After you make one piped peplum top, you may find yourself addicted like me. This shirt has already gotten a lot of wear so far! I can tell I’m going to be making even more of them as my daughter grows. Thanks so much for having me Meg! I can’t wait to see what everyone else is making for fall. If you’d like to see what else we’re up to, you can visit Shannon and I on Eat. Sleep. Make. Today we are showing off how to sew the corduroy cuffed pants that you see in these photos, made to match the piped peplum top! Click here to see how to sew the cuffed corduroy pants! Jen – this top is fabulous!! Can’t wait to make them for my girls. Well done! I was just wondering what adjustments would have to be made if I wanted to make one without the piping? Thanks! This is adorable. My niece will get spoilt this chrissy! Hi Ellen! If you want to leave the piping out, the only adjustment you’d really need to make is to make the front bodice piece (the one with the piping) the same size as your front lining piece, which is about an inch less in width. Rather than cutting out a front bodice, just use your front lining pattern to cut out both a lining and a main bodice piece (you’ll find the link to the pattern pieces in my post.) I hope that helps! Oh my gosh, I would LOVE to see it! Email me at jen(at)eatsleepmake(dot)com please! So cute! Could you please tell me the name of the fabric you used? I have some throw pillows in the exact same fabric, that I bought at Marshall’s last year! I would love to sew some matching window valances, if I could track down matching fabric. Do you have the patterns for other sizes available? thanks…it’s sew cute! I would love to make this top but do you have the patterns in size 6 and 9. Thank you.